DIY Ink Refill Kit System. Power Cords should not be exposed to moisture as they are not waterproof. UL & CSA Certified Marked & Cuttable at each Meter (39.5 Inches) Eco Friendly and Saves Energy. High Flexibility, Temperature Sustainability, and UV Resistance. Clear and Durable PVC Tubing. Marked & Cuttable at each Meter (39.5 Inches). Easy To Shape, Highly Flexible Material. Eco Friendly and Saves Energy. Includes: 3 x Power Cables/ Controller. 6 x Power Connectors (splicers), 6 x End Caps. LED Per Meter (39.5): 36. Operating Temperature: -20 - 50°C. Rated Life: 50,000 Hours. Pre-assembled and ready to use. DIYinks is dedicated to providing alternative ink solutions at an affordable price. We stand behind the quality of our products and work diligently to ensure every customer is pleased with their experience with us. We have no control over them, nor will be able to quote you on what they may be. The United States Postal Service does not guarantee any dates, so neither can we. Tracking information will be updated once the carrier picks up your item. We are able to provide local pick-up for items. We have a retail location located in South El Monte, CA. Our address is 2213 Edwards Ave, South El Monte, CA 91733. Item must be in the original box, and in new condition. DO NOT WEAR OR USE OUTSIDE! Please be patient and wait one full day before emailing us the same request again. 2213 Edwards Ave South El Monte, California 91733. 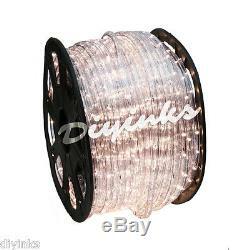 The item "Warm White LED Rope 150ft 110V 2 Wire Flexible DIY Lighting Outdoor Christmas" is in sale since Monday, December 22, 2014. This item is in the category "Home & Garden\Lamps, Lighting & Ceiling Fans\String Lights, Fairy Lights". The seller is "diyinks" and is located in Los Angeles, California. This item can be shipped to United States, Canada.